Pizza lovers, prepare yourselves for a beautiful sight. 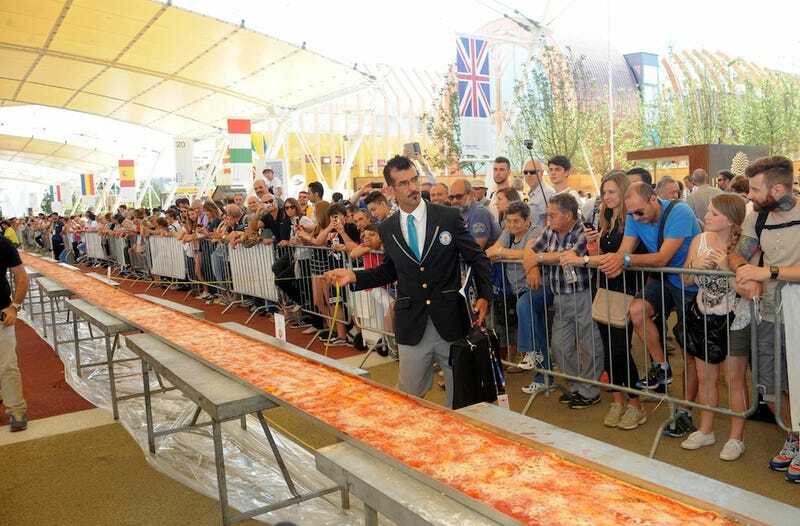 At Milan’s Expo 2015 World’s Fair, over 60 of Italy’s best pizza chefs joined forces to create the world’s longest pizza. An official Guinness Worlds Records judge was on hand to witness the finished product, which measured out to over 1.5 kilometers, or almost a mile long. According to AP, the record-breaking pizza weighed a total of 5 tons, consisting of 1.5 tons of mozzarella and 2 tons of tomato sauce. The best thing about this whole thing? Event attendees were able to enjoy the pizza for free.